Christian, Bookworm, Animal fan and Tea lover. I am passionate about making a difference where I can. I have been having a pretty bad day, so I decided to try and turn it into something positive. The past week has been a crazy blur of teaching, a carnival party and watching Romeo and Juliet in the theater for the first time. To some of you that sounds like a dream but right now I am exhausted and really not rating myself as a teacher. Some days I feel like a great teacher and then some days I feel like the worst teacher in the world. My colleague (and boss) keeps telling me I am doing well but I can’t help but feel that she is just being nice. I feel like I am doing horribly, I never feel quite in control of the class and despite my efforts to make it better I am terrible at discipline. Long story short I feel like a disaster in the classroom and in my social life. I have the unfortunate tendency to withdraw when I am feeling low, so then I feel lonely but technically that is my fault. I love Italy but I hate it too and I love teaching but sometimes I worry so much that I won’t be any good and I stress over everything! So then I am striving to enjoy it. I know teaching is for me but I think I might be setting my goals a little too high. It has only been a month and I have never really taught before now. I saw Romeo and Juliet which was amazing and I loved it. It was the first time the language hasn’t been a barrier! I have had dinner with some lovely families and made a new friend. The weather has been wonderful this week. The carnival party was so much fun, I love dressing up (I was a Dalmatian). It will get easier (I hope so). Thats about all I can manage right now, sorry to be negative, this blog is a way for me to process my feelings and hopefully some of you understand what I am feeling. The truth is that I live in a beautiful country and I have no reason to complain, so I must persevere. If you have been following my blog I would like to thank you. I do not write particularly well and the content is not very interesting but you still seem to be here and enjoying my blog posts so I am grateful! I am no longer miserable here but I am no longer on a super high (It was fun while it lasted 😉 ). I am trying to find a happy medium where I am not plagued by homesickness whenever I think of home but filled with happiness because I now have two countries I can call my home. I have a feeling it will take a while for this to happen so I will try to be content with where I am now. I have been invited to two different dinners, both families served pizza (I LOVE pizza) and both evenings were delightful. Italy may have some faults but I can never find fault with the people here, at least in the south. I have also become a bit of a shopaholic in the past month which is mostly due to the fact that I have a lot of free time. I also love buying new things, clothes are my latest obsession! I went to Reggio Calabria recently, where the weather and the town are equally beautiful. I was treated to “the best ice cream you will ever taste” as my friends put it. They were not wrong there, I was in heaven. Ice cream makes me excessively happy, I love it. You might have noticed by now that I like food, a lot! I also picked up some lovely clothes and my new favorite jumper (I will include a picture of it). I can’t tell if this move has made me more materialistic or more grateful for the things I have. I hope its the latter as I would like to grow as a person, not go backwards! Teaching is wonderful as I have now introduced a Star Chart system for my rather loud class of 7-9 year olds. It works a treat, much to my relief. I am still learning every day that being a teacher is the least glamorous job I could ever have. For example last weekend I spent 2-3 hours cutting out tiny triangles to glue onto pictures of Arlecchino for the Carnival party this weekend. My life is truly thrilling. The funny thing is I wouldn’t change it for the world, I really love teaching and it is such a relief to find a job I actually like. I thank God that I am lucky enough to have realized this fairly early in my life. Its not enough for me to do the bare minimum for this job, I have to put in 110% because teaching these children in an effective and fun way has become my main priority. All in all I am content here and I am getting closer to building a life for myself. I have been truly blessed and I know there are more blessings to come. I never do reviews but I have been looking for a book subscription box for so long and I have found one that I love. I thought some of you might also be in the same position so I am directing you to Prudence and the Crow (http://www.prudenceandthecrow.com). It is the best book subscription I have seen, it is so cute; with its personal touches and there is a wide variety of book genres to choose from. I chose classic fiction (Obviously) and I am so glad I did. 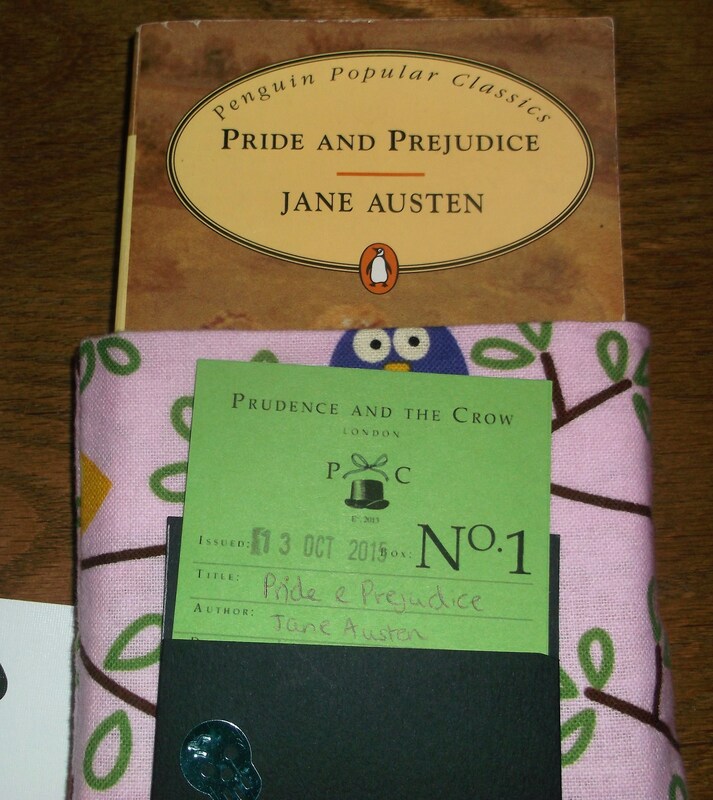 I received Pride and Prejudice by Jane Austen and I am thrilled for two reasons. Firstly Jane Austen is one of my favorite authors and my sister took my only copy of Pride and Prejudice with her to University so I have a new copy now! It came with the most adorable book bag, owl prints happen to be my favorite. 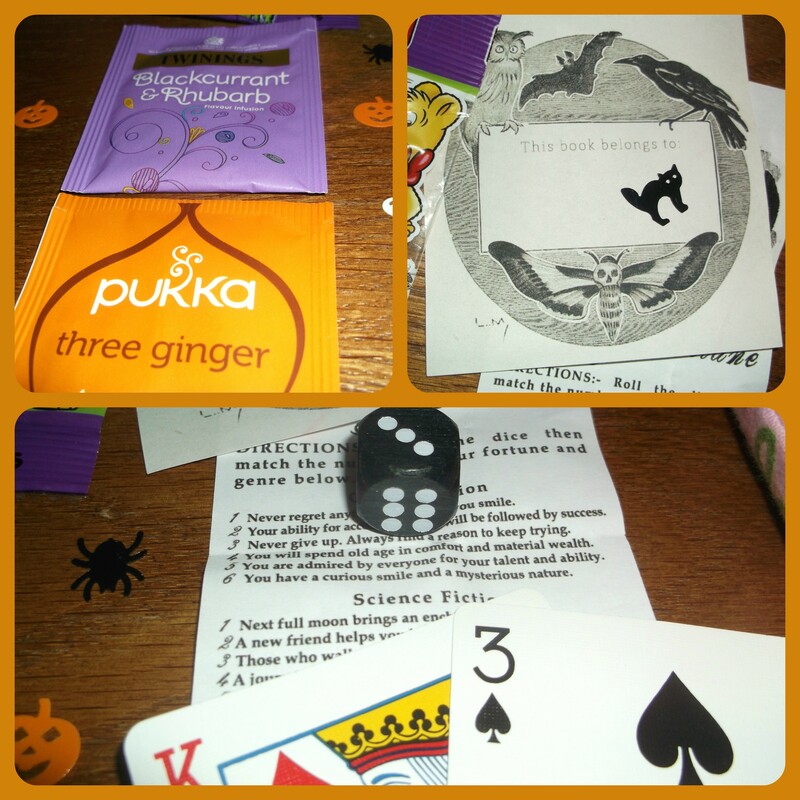 As it is October it was Halloween themed and came with lots of lovely little bits and pieces including: two playing cards, a library ticket, a dice and a cute little game, two types of tea (I love tea! 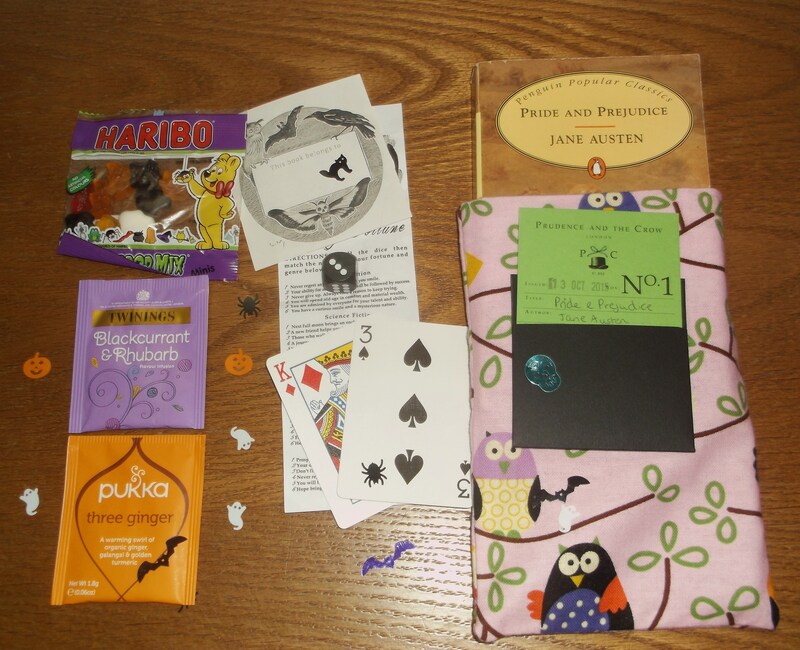 ), sweets, Halloween confetti and a cute book sticker. 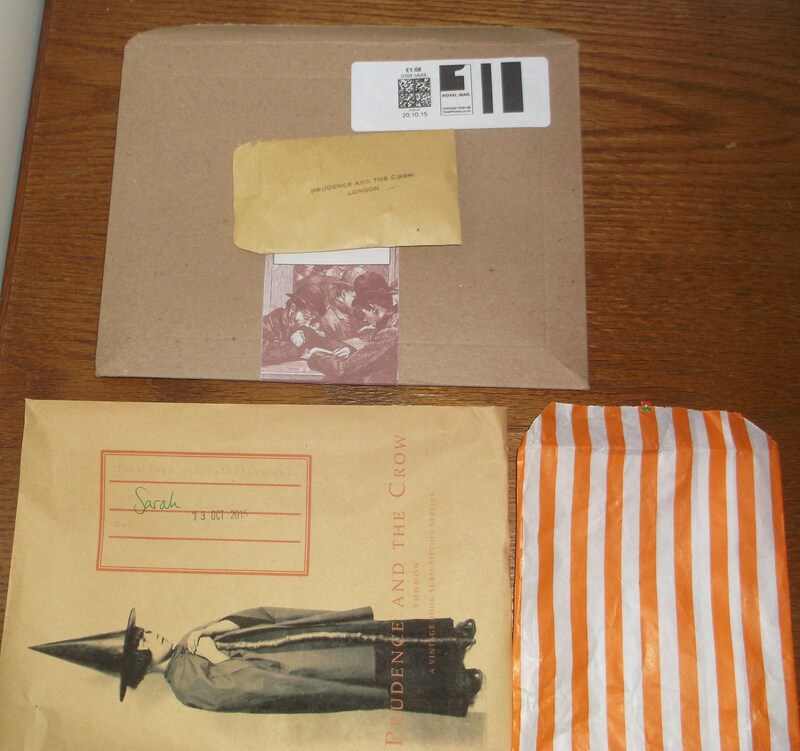 This subscription is adorable and I love it. The best part is that it only costs £12 per month, which is crazy! Its cheap and it is adorable, what more could you ask for? Thanks for reading, I hope this inspires you to give a book subscription a go, you might end up loving it!